Pressure is rising with only 24 hours to go before the first launch attempt. Today we checked out all our electronic systems for interference by means of an electromagnetic compatibility test. This in simple terms is just turning all your transmitting and receiving systems on and verifying if they all still work. Other than checking all our electronics, we started final integration of the engine by loading the injector bulkhead and igniter assembly in the motor. These last steps are only performed now as we have a small pyrotechnic charge in the igniter so we assemble that as late as possible. 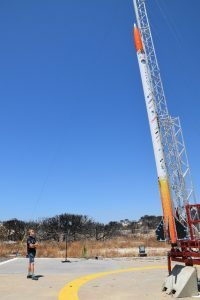 Furthermore, we had a meeting with INTA, the launch range provider to confirm that we can attempt to launch on Tuesday. The wind is just within the safe range so we might have to hold on Tuesday until the wind speed is low enough. During the meeting, we also found out that our launch tower was 3 degrees off heading, and thus we had to take down the tower and rotate it back to make sure we head in the right direction. Stratos III in the launch tower. 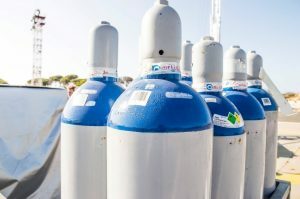 All the nitrous oxide bottles were connected to the ground feed system and the ground feed system was pressure tested and considered leak tight. This system will transfer the oxidizer from their storage containers into the rocket. Nitrous oxide cylinders at the launch pad. For tomorrow we will have a go/no-go moment with INTA around 14:00 CEST and at 14:45 CEST we will start the live stream. The first part of the live stream will cover the roll-out and loading of the rocket in the launch tower and is not hosted. The hosted part of the live stream starts at 20:30 CEST – about half an hour before the aimed lift-off time. In the meantime, make sure to check out our pre-launch video and the Stratos III Android app to be ready for the epic launch tomorrow!